Anna Chen writes and presents A Celestial Star In Piccadilly, a profile of Hollywood’s first Chinese movie star for BBC Radio 4. 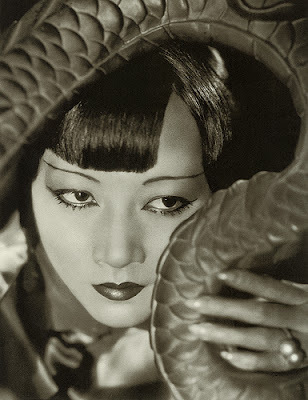 I wondered who the young Anna May Wong had to look up to. She grew up as third-generation Chinese born in a youthful America when Native Americans were safely out of the way on their reservations and former slaves were consigned to ghettos and plantations. Chinese-Americans were about as low as you could get; depicted as so much of a danger to working men and decent citizens that the US government introduced legislation specifically designed to curb the ambitions of the Yellow Peril within. Their ambitions may have been humble — earning an honest dollar for one’s labour, living in safety and security, bringing up families of their own — but the owners of capital tolerated them only as cheap labour, while much of the labour movement in both the Britain and the USA (Wobblies excluded) saw the Chinese as more of a threat than as fellow workers. Many thanks to Mukti Jain Campion of Culture Wise.